Last year we wrote a blogpost about our exciting meeting with Kathryn, who told us more about her new company Nana’s Manners. You can read that post here. 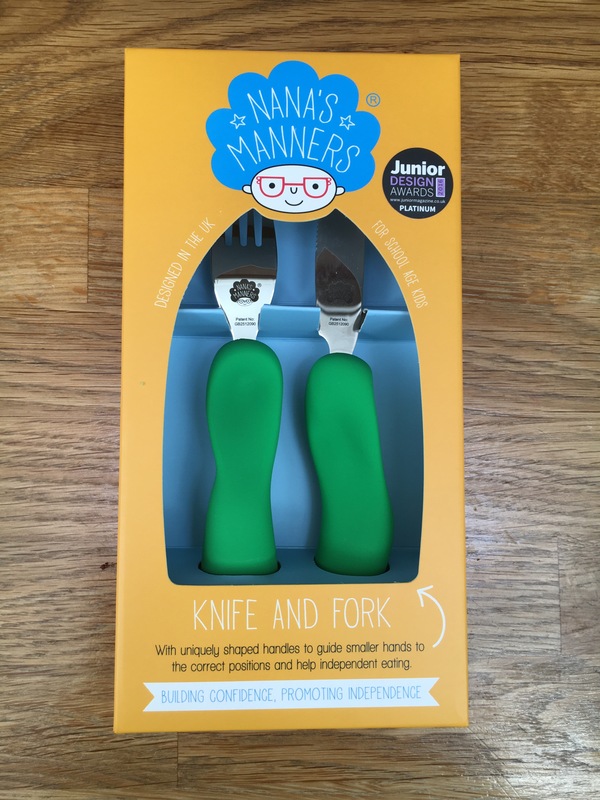 We’ve been eagerly awaiting the arrival of Nana’s Manners first product – their cutlery. The production process took a lot longer than expected which is why we say eagerly awaited – we ordered our set last Summer. But we can honestly say it was well worth the wait! My charges love the conversation cards that we’ve had around the house for a long time, and recognised the branding when they spotted the box of cutlery. We couldn’t wait to open it and get our hands on the cutlery..
Each pack contains stickers to initially guide children on how to hold the cutlery correctly. Each sticker has a fun monkey face – I found my 4 year old holding the cutlery properly in no time at all. Children seem to just be able to pick up the cutlery and put their fingers where they are supposed to go, naturally, which is wonderful. So far we have tried the cutlery by chopping some sausages and then also a banana, through the skin. The great thing about Nana’s manners cutlery is that it actually cuts! Children can learn the art of eating properly without the frustration of the miniature knife they’ve been given not even cutting their food. I’m convinced that Nana’s Manners Cutlery will improve children’s eating abilities, independence and also table manners. I feel that meal times will be more fun and relaxing because the ‘tools’ I give the children will do the job that they are supposed to do. We would whole heartedly recommend the cutlery to anyone with school aged children. Keep an eye on the latest on Twitter and Instagram and order your Nana’s Manners products here. * This information has been taken directly from Nana’s Manners website.